Stock # 2893, V8 Edelbrock, Automatic, 79416 mi. CUSTOM ONE OF A KIND OFF ROAD CJ!! NEW TIRES!! 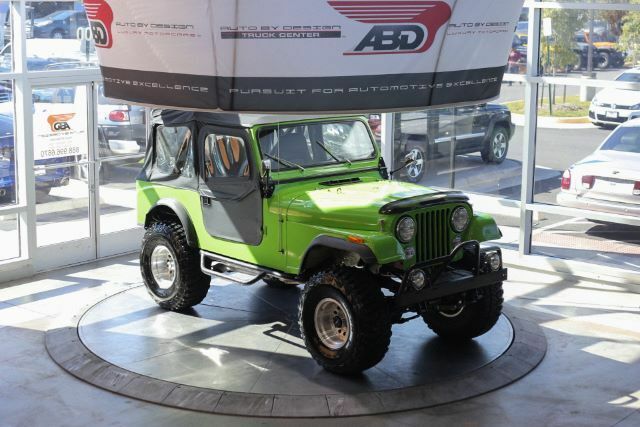 This 1981 Custom Built AMC CJ is featured in Lime Green with a Black Soft Top and Black Interior! Features a V8 Edelbrock mated to an Automatic Transmission. This CJ was tastefully customized with 4X4, CJ7 Style Fiberglass Body, Premium Pioneer Sound System, AUX Input, B & M Shifter, GT Grant Steering Wheel, 3-4 inch Tuff Country Suspension Lift Kit, Steel Bumper, Fog Lights, Running Boards, Front Tow Hooks, Dual Mid Exit Exhaust System, RJS Racing Seat Belts, Tuffy Security Lock Box in Center Console, Tow Package, 15 inch Steel Wheels wrapped in 35X12.50R15LT Good Year All Terrain Tires and Matching Spare! This CJ has it all! Its ready for the outdoors! ****** All of our high-end vehicles are processed through a Multi-Point Inspection to ensure that the vehicle is of the Highest Quality & Drivability, please inquire about our vehicles and ask a representative for more information. ******We offer Nationwide Shipping right to our door step and we offer Worldwide Shipping logistics as well as Financing is also available for our vehicles with rates as low as 3.79%** for well qualified buyers**. Auto loans are our specialty. We are experts in helping individuals with good and bad credit obtain a car loan for the purchase of a new or used vehicle. All of our new and used car loan services are hassle-free and there is no obligation for you to apply for a car loan today. We can help you finance your next car, truck, van, or sport utility today with our easy auto loan application.